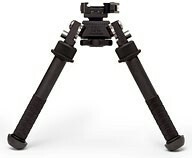 This is my second Atlas bipod. The Atlas is a precision instrument build to last yet compact and light. The ability to adjust the legs forward and backward independently is a huge plus for shooting on uneven surfaces. It is also a modular unit where one can add longer legs and feet. I shoot from a bench and I am able to lock the bipod once I have my rifle level. It has helped my ability to shoot accurately. I don't like to lug around to much equipment. With this bipod, I don't really find a gun vise necessary. Needless to say, I highly recommend this product to anyone who is looking for a light and versatile bipod. Check out the video on youtube to see for yourself.